Opinions are more divided about the amount of help the government provides for younger people: About half (51%) say the government does not do enough for younger people, 29% say the government provides about the right amount of help, while 13% say it provides too much. The national survey by Pew Research Center, conducted Jan. 10-15 among 1,503 adults, finds that views on government help for the poor, the middle class and the wealthy – as well as for older people – have changed little in recent years. This is the first time this series has included a question about younger people. There are partisan differences in views of government support for all groups included in the survey. However, the gap is somewhat narrower in views of government help for older people than for other groups. While 73% of Democrats and Democratic-leaning independents say the federal government does not do enough for older people, a smaller majority of Republicans (58%) say the same. The partisan gap is much wider in views of government help for younger people. Nearly seven-in-ten Democrats (69%) say the federal government does not provide enough help for younger people. 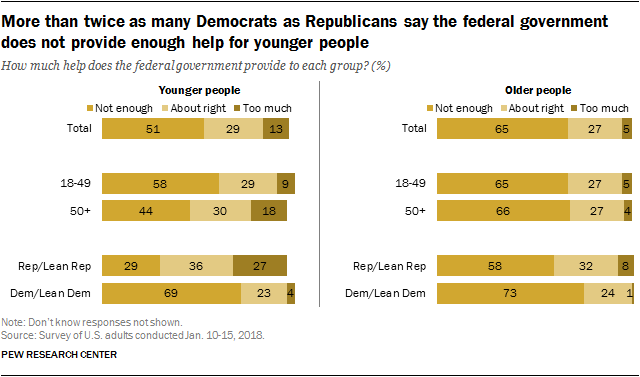 Republicans are divided: Nearly equal shares say the government does too little (29%) and too much (27%) for younger people, while 36% say it provides about the right amount of help. In addition, there are sizable age differences in views of government help for younger people – but not in how much the government does for older people. A majority of those younger than 50 (58%) say the government does not do enough for younger people, compared with 44% of those 50 and older. Nearly identical shares of those under 50 (65%) and those 50 and older (66%) say the federal government does not do enough for older people. The partisan divide in views of government aid for the poor is wider than for other groups. Fully 82% of Democrats say the federal government does not provide enough help for poor people, compared with just 36% of Republicans. 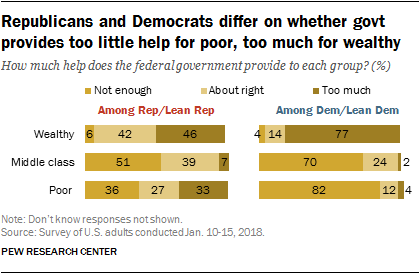 About as many Republicans say the government does too much for the poor (33%) as say it does too little; 27% say the help the government provides is about right. Pew Research Center’s recent report on the public’s political values found that partisan differences in attitudes about aid to the poor and needy have widened considerably over the past two decades. In that study, 71% of Democrats said the government should do more to help the needy even if it meant going deeper in debt, compared with 24% of Republicans. Democrats and Republicans also differ in their attitudes about the help the government provides to wealthy people. A large majority of Democrats (77%) say the federal government provides too much help to the wealthy. As with views about government help to the poor, Republicans are divided. 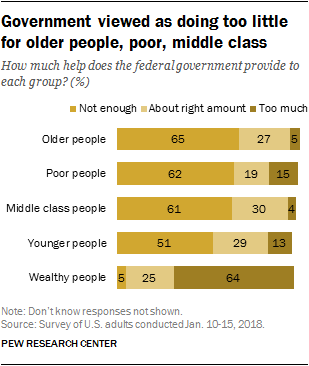 Nearly half of Republicans (46%) say the federal government provides too much help for wealthy people, 42% say it provides about the right amount, while 6% say it does not provide enough help. Partisan differences in opinions about the federal government’s help for the middle class are not as pronounced. Seven-in-ten Democrats say the government does not provide enough help for the middle class, compared with about half of Republicans (51%). Republican attitudes about government help to the poor, middle class and wealthy differ significantly by family income. Democratic opinions vary much less across income levels. Nearly half of Republicans with incomes under $40,000 (47%) say that the government does not provide enough assistance for poor people. This is considerably higher than those who make between $40,000 and $75,000 or $75,000 or more; only about three-in-ten in these income brackets say that poor people do not receive enough assistance (32% and 28%, respectively). A similar pattern is seen on opinions about government help for the middle class. A majority (59%) of lower-income Republicans say the middle class does not receive enough help. That compares with about half of Republicans with higher family incomes. And while 58% of Republicans with incomes of less than $40,000 say the government provides too much help to wealthy people, only about four-in-ten (41%) of those with incomes of $40,000 or more say the same. 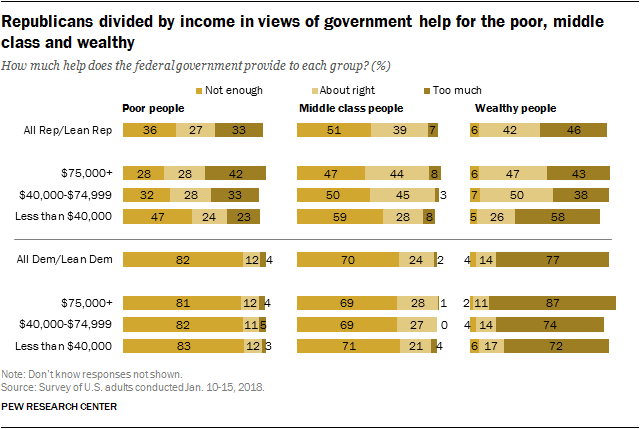 Large majorities of Democrats across income categories say the federal government does not provide enough help for the poor and middle class, and that it provides too much help for the wealthy.